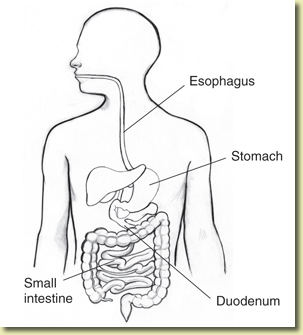 What is upper endoscopy (esophagogastroduodenoscopy)? The upper GI tract must be empty before upper GI endoscopy. Generally, no eating or drinking is allowed for 4 to 8 hours before the procedure. After upper GI endoscopy, patients are moved to a recovery room where they wait about an hour for the sedative to wear off. During this time, patients may feel bloated or nauseated. They may also have a sore throat, which can stay for a day or two. Patients will likely feel tired and should plan to rest for the remainder of the day. To prepare for upper GI endoscopy, no eating or drinking is allowed for 4 to 8 hours before the procedure.